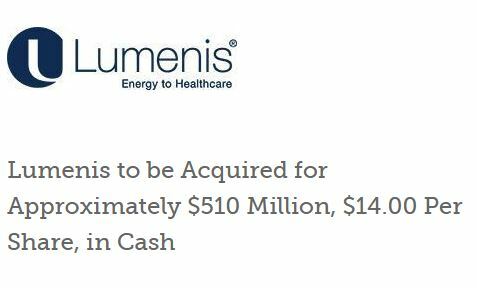 Lumenis Ltd. (NASDAQ: LMNS), the world’s largest energy-based medical company for surgical, ophthalmology and aesthetic applications, announced today that it has signed a definitive agreement to be acquired by XIO Group for $14.00 per share in cash, for an aggregate purchase price of approximately $510 million. The prospective transaction is subject to customary closing conditions, including approval by Lumenis’ shareholders and receipt of certain regulatory approvals, and is expected to close in September 2015. The Board of Directors of each of Lumenis and XIO Group has approved the transaction. The two largest shareholders of Lumenis, Viola Group and XT Hi-Tech Investments (1992) Ltd., which collectively own approximately 59% of the shares of Lumenis, have entered into a customary voting agreement with XIO Group. Goldman Sachs acted as the exclusive financial advisor to Lumenis in respect of this transaction. Morgan Stanley acted as the exclusive financial advisor to XIO Group. Information provided in this press release may contain statements relating to current expectations, estimates, forecasts and projections about future events that are “forward-looking statements” as defined in the Private Securities Litigation Reform Act of 1995. These forward-looking statements may include but are not limited to statements about the expected completion of the proposed transaction with the XIO Group and the timing thereof, the satisfaction or waiver of any conditions to the proposed transaction, anticipated benefits, growth opportunities and other events relating to the proposed transaction, the Company’s plans, objectives and expectations for future operations, including its projected results of operations. Forward-looking statements are often characterized by the use of forward-looking terminology such as “may,” “will,” “expect,” “anticipate,” “estimate,” “continue,” “believe,” “should,” “intend,” “plan,” “project” or other similar words, but are not the only way these statements are identified. These forward-looking statements are based upon our management’s current estimates and projections of future results or trends. Factors that could cause actual events, results, performance, circumstances or achievements to differ from such forward-looking statements include, but are not limited to, the following: (1) the Company may not be able to satisfy all of the conditions to the closing of the proposed transaction; (2) the proposed transaction may involve unexpected costs, liabilities or delays; (3) the Company’s business may suffer as a result of uncertainty surrounding the proposed transaction and diversion of management attention on transaction related matters; (4) the outcome of any legal proceedings related to the proposed transaction; (5) the Company may be adversely affected by other economic, business, and/or competitive factors; (6) the occurrence of any event, change or other circumstances that could give rise to the termination of the merger agreement; (7) difficulties in recognizing benefits of the proposed transaction; (8) the proposed transaction may disrupt current plans and operations and raise difficulties for employee retention; (9) impact of the transaction on relationships with customers, distributors and suppliers and (10) other risks to consummation of the transaction, including the risk that the transaction will not be consummated within the expected time period or at all. Actual results may differ materially from those projected as a result of certain risks and uncertainties, including those risks discussed under the heading “Risk Factors” in our most recent Annual Report on Form 20-F filed with the U.S. Securities and Exchange Commission. These forward-looking statements are made only as of the date hereof, and the Company undertakes no obligation to update or revise the forward-looking statements, whether as a result of new information, future events or otherwise.